I had a requirement to improve the parental filters on the home network. OpenDNS is a good solution for this, however, I also use other DNS providers to stop being geo-blocked. I need a solution that allows some machines to be pushed through to OpenDNS and others to my other DNS provider (unotelly). 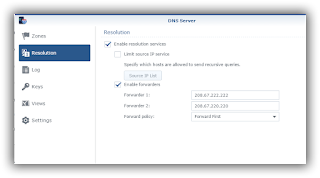 I have a synology NAS running diskstation, and that has the ability to control DNS, however, the GUI doesn't provide the feature I am looking for. Under the hood it's using dnsmasq, and I can ssh onto the box to make changes required. The first step was to enable DNS on the Synology router (and disable it from my router). This puts the Synology in control of the DNS selections I run. My diskstation runs on the IP 192.168.2.101. 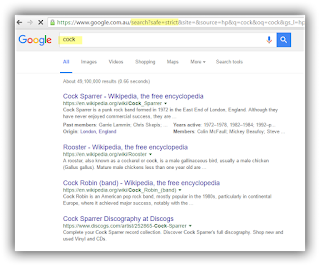 I also installed the Synology NameServer and that was to be used for a few things, amongst which is google safe searching, as written about previously. 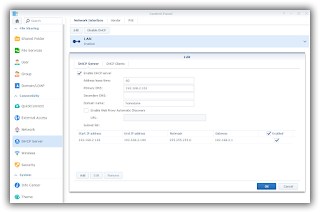 The first step was to enable the DHCP server. I pointed the primary DNS back to itself, which is running on 192.168.2.101. I also entered the various static allocations that I require that map MAC addresses to some fixed IP addresses. I typically allocate any of the children's wifi devices (laptop, iPad) to the 192.168.2.12x range. Now inside DNS server, I configured it to point to OpenDNS. 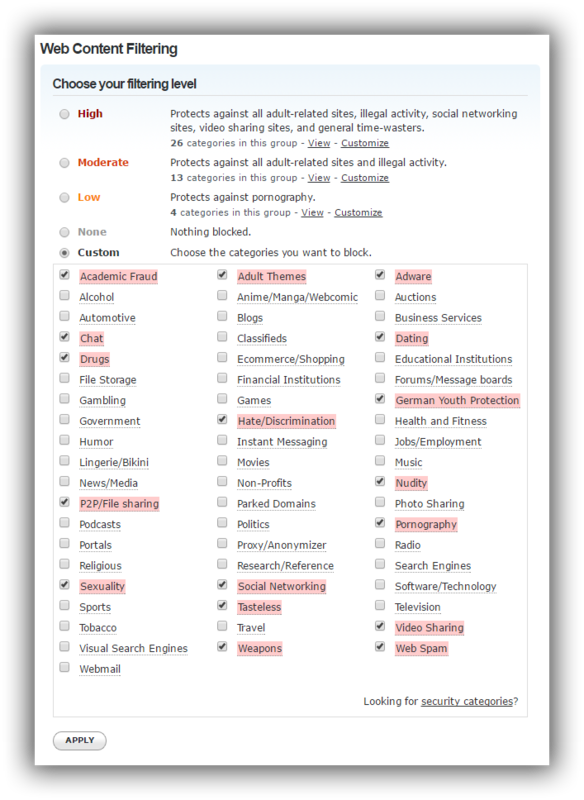 Inside OpenDNS, I configure some required filters. The next issue though was how to unblock my own PC from such restrictions, and use a different DNS provider. 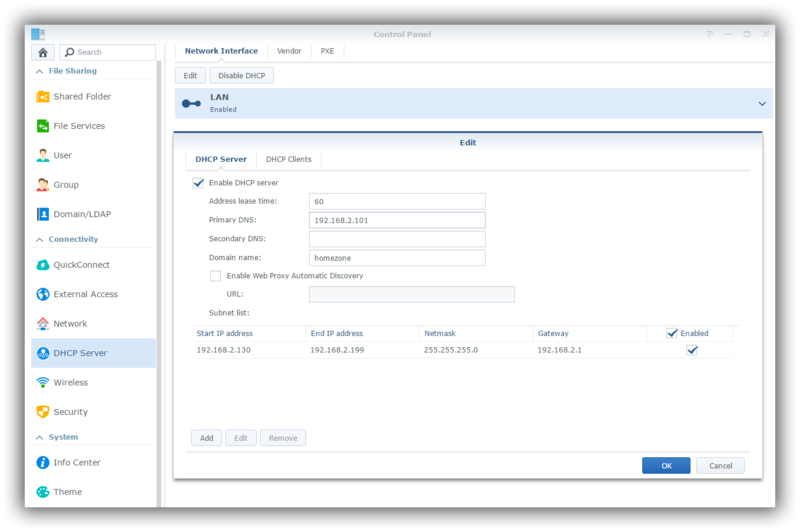 Well, it appears that the Synology is using dnsmasq under the hood, and not everything is available via the GUI. But using ssh onto the box, you can create better flexibility. Where the dns-servers were entries for unotelly dns that I required (and differ from the default nameserver 192.168.2.101 and the entries found inside its Resolution (forwarder) settings!). I also adjusted the config recently, so that i called them unodns, I added in googlesnameservers 8.8.8.8. Should I have issues with unodns, then i swap over to googdns, by renaming it to altdns. (And yes this changed was made because I had a problem with unodns, which meant I dropped into the OpenDNS defaults). If you want to know more about the settings in dnsmasq, I used this reference. I got the idea of the config above having read this. Now restart the service (sudo /etc/rc.network restart). If you want to check the contents of the /etc/dhcpd/dhcp.conf file - it should contain the entries that are stored in dhcp-extras.conf. Now when I perform an ipconfig /all I can see the dnsservers allocated correctly. This is just the first of my exploration in this area, it proves it works. I may revisit the configuration and investigate options around different ip ranges, but that is for another day.